What you see here is the new 300mm f/4 (left) versus the 14-24mm f/2.8 (right) sitting on my light table next to one another. Yeah, interesting. Nikon’s sudden interest in Phase Fresnel (PF) has the chance to change our camera bags. By using PF elements, weight definitely comes off. The old 300mm f/4 was 50.8 ounces while this new one is 26.6, a very welcome 48% reduction. Nikon also seems to have gotten the message about smaller, too, as the new lens is 5.8” in length while the older one is 8.8”, a 34% reduction. Typically, longer telephoto lenses have tended to be close to the focal length in their overall length (especially when you consider the mount to sensor distance. 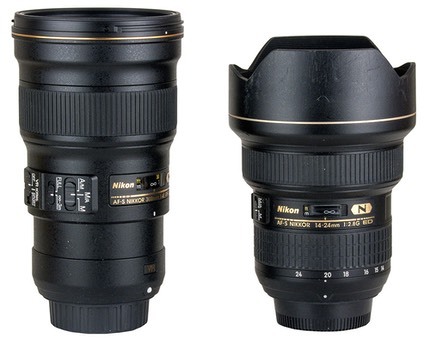 That the 300mm f/4 PF isn’t seems to indicate that Nikon is transitioning their designs. If you look at the optics of the new lens, you’ll see that they’re more complex. I don’t believe that the PF element itself is driving the length reduction, I believe the added complexity of the optical chain is. The PF element itself is going to be a bit controversial, as it produces a unique ring flare with very bright in-frame light sources and some that are just off frame, too. For most of us that just means we have to be careful when shooting contre-jour during the edges of the day. However, it appears that PF is going to become more important in Nikon’s future lens lineup, as we have multiple new patents with PF elements. The future 200-400mm f/4-5.6 just seems in the same vein as the 300mm f/4: produce a smaller, lighter telephoto option that’s mostly going to be used outdoors and rarely would encounter the flare problem. But the future 24-70mm f/2.8 VR PF patent raised my eyebrows. There’s a lens that would be used in situations where strong light in frame might be encountered, and I can’t imagine that the VR wouldn't have an impact on the shape/look of the flare in some situations. Nikon recently updated its software (e.g. Capture NX-D) to include a PF flare removal feature, which seems to also indicate intent to produce more PF lens designs. I can’t believe they’d have put that there for just one lens that isn’t typically going to be used in situations that create the problem. This doesn’t eliminate the flare problem, by the way, it only reduces the ugliness of it. So Nikon has gotten the smaller, lighter message. Coupled with the carbon fiber front panels on cameras like the D750 and D5500, we seem to be moving towards a future with more manageable size/weight options. Taken to its extreme, it’s going to change what we carry and how we carry it. I was struggling over which telephoto to take hiking in Patagonia with the D810. Not any more. I’ve now got a decent reach option that’ll net me 450mm equivalent at 15mp. At a hikeable size and weight. Let’s hope it performs as well as the original 300mm f/4.